This entry was posted on Wednesday, February 1st, 2012 at 2:10 pm	and is filed under History. You can follow any responses to this entry through the RSS 2.0 feed. Both comments and pings are currently closed. Wherever did you find this? 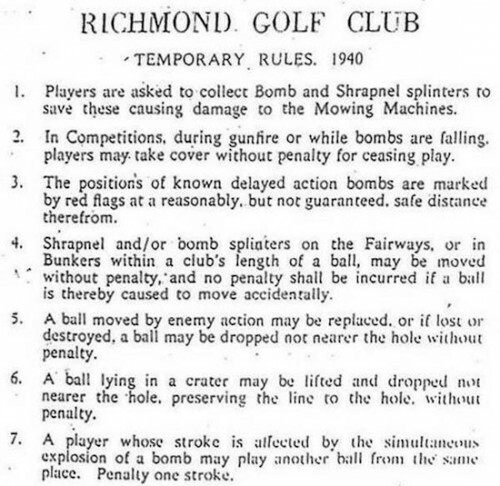 English golfers are very serious about sticking to the rules, but I guess modifications must be made when dealing with bombs. Sometimes I drop a bomb on my scorecard. I know I have blown up during many rounds of golf. I honestly can’t remember where I found it – on one of the sites I was trolling today. That has to be one ballsy golfer! I was reading a book by the historian Jack Wheeler-Bennett the other day, and saw that he’d been shell-shocked as a youngster by a German bomb dropped on his school in southern England in WWI. Man, that could have inspired a great Monty Python skit. Snopes says it’s true — and has some links. The Greatest Generation–also The Craziest.